Fishing for crappie is great fun, and there are a ton of products out there that guarantee you great results when it comes to crappie fishing; huge lists of baits that are supposedly ideal for catching crappie. But, like all things fishing, all the clever marketing schemes in the world can’t beat the old classics. No matter what the guy selling the $40 crappie lure says, there are no real revolutions when it comes to crappie fishing - just improvements on old classics. Let’s take a look at the best types of crappie baits on the market, and then we’ll dive into some product recommendations. 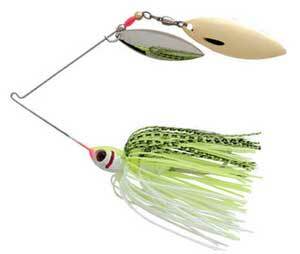 Livetarget Crappie Crankbait 2 1/2"
Jigs are great for catching crappie. Dragging them across the bottom of the water, kicking up mud and rattling off of rocks and grasses, you’re sure to catch the attention of your prey with a nice jig. While they can be a little harder to master, with some practice, you’ll get the hang of the action required to produce that skipping action that drives fish nuts, and you’ll be dragging out more crappie than you know what to do with. The best jigs for crappie are usually more rounded, as these tend to stay horizontal in the water. We find that crappie tend to react poorly to vertically oriented jigs, while horizontal jigs tend to bring them in quite well. This jig is perfect for crappie fishing. It comes in tons of colors, ranging from bright neons for bright days and murky waters, to darker, silhouetted jigs, appropriate for overcast days. The rounded head is attached horizontally to the lure, making it perfect for crappie, who much prefer the sideway skittering action of horizontal jigs to standard jigs that tend to stand straight up in the water. With a little practice, you’ll be reeling them in like nobody’s business, as this little jig skips, hops, and jumps across the bottom of the water. It’s no surprise that crappie like spinners. All fish do! The varied, flashing action of spinning blades is great for bringing in crappie, who generally seem to prefer golden or brass-colored spinners over their more subdued silver brethren. Spinners are also great to pair with jigs, especially in murkier waters where your jig might be overlooked. 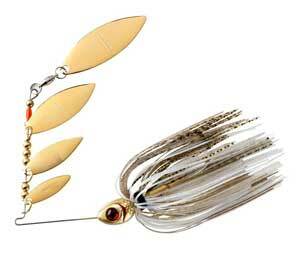 The spinner will bring em in, and they’ll latch on to the jig once they see it dancing across the bottom of the water. The Booyah Super Shad is, simply, one of the best spinner’s we’ve ever had the pleasure of using. Not one, not two, not three, but four spinners are arranged in a unique design ranging from small to large, and finished off with a sharp hook on the other side that’s covered by a high-quality 55 strand silicone skirt. 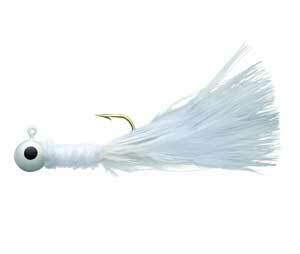 Its unique design mimics the appearance of a fleeing school of baitfish, and the uniquely attached spinners are free to float as they please, creating a vibrant yet natural appearance that’s just flashy enough to really bring in the fish. For crappie, we recommend the “Golden Shiner” colorway, or the “Chartreuse Golden Shiner” colorway if you’re looking for a brighter skirt. Nobody’s really sure why, but crappie seem to prefer the flash, shine, and appearance of gold-colored spinners over others, although we’d recommend picking up one of these in any color you please if you’re not just looking for crappie. 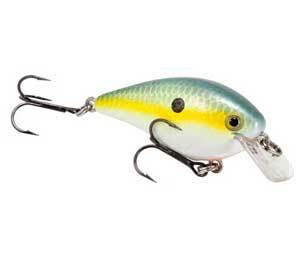 The Super Shad combines really well with a jig like the Eagle Claw too, as mentioned, if you’re fishing in murky waters and having trouble bringing in the fish with a plain-old jig. Rig up your jig with the Super Shad, let it bring them in, and they’ll be hooked on your jig in no time at all. Crankbaits make for good crappie lures when you’re trying to fish across larger bodies of water, or are worried about fish density – they can cover a lot of distance quickly, and have actions that are easily predictable, so you can reel them in consistently and create a presentation that will attract crappie and other fish. You’ll want to look for one with a pretty active presentation, and preferably with some vibration and noise that it makes to help draw attention to it. 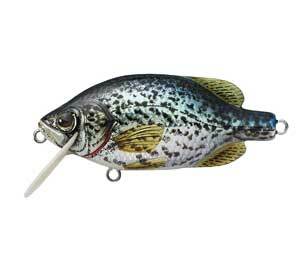 While just about any crankbait can be effective at catching crappie, we love this Crappie Crankbait by LIVETARGET. Crafted with a subtle, hyper-realistic decoration, and using internals that generate a soft rolling action and tight wiggle that’s specifically designed to attract crappie, it’s a cut above other crankbaits. 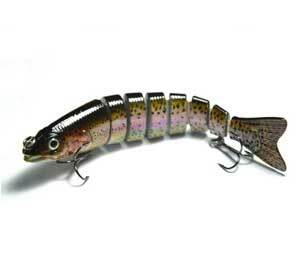 It’s designed to sit about 4-5’ under the water – the perfect height for attracting crappie. The hyper realistic design, profile, and silhouette combine with a natural swimming presentation that’s sure to bring in the fish, and this crankbait is designed to twitch at the point of contact when struck, providing a natural reaction that is sure to fool even the wiliest crappie in the pond. It also comes with three hook attachments, allowing you to secure high-quality hardware and giving you plenty of sticking power once your prey tries to take a bite, and the durable design of this lure means you won’t be losing any hooks (or the lure) to strong bites or big fish. It can handle just about anything. Rubber grubs are great at bringing in crappie, as long as they’re manufactured so that they’ve got a natural movement and presentation. Stiff and unyielding rubber grubs usually won’t bring in great results, because they’ll just kind of sit there, and won’t mimic the motion that a real grub would have. The more the merrier! 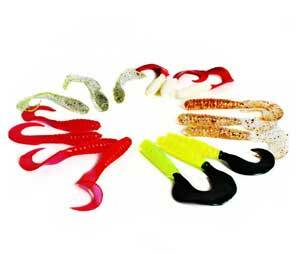 This gigantic 100 pack of 5 color grubs may be cheap, these well-crafted, soft rubber lures are also incredibly effective, especially when it comes to crappie, which generally prefer grub-style rubber baits over worm-style rubber bait. Lightweight and very soft, these grubs manage to avoid the stiffness problems that can often make rubber grubs unusable when it comes to crappie. They present in the water very naturally and sit well on the hook. And though you may lose a few while fishing, this incredible bargain means you can always have plenty of extra grubs stuffed away in your tackle box. There are also a huge variety of colors included with this batch of grubs, so you can be sure you’ll always have the right grub, no matter the weather or water conditions. While they may not be flashy as spinners, jigs, or crankbaits, there’s a reason that experienced anglers turn to rubber baits again and again. They’re reliable, versatile, and predictable, which are three good reasons to have an ample stash of these in your tackle box. Any suspender/swimmer shaped like a shad, minnow, or other baitfish will do the trick. Usually, you’ll want one that can go from surface to about 12 feet down, as that’s the prime area for crappie strikes, and how you rig it is up to you. If you’ve got the skills for it, you can easily grab crappie with a twitchy surface rig, or you can slap some weights on and dive a little deeper for a more consistent swimmer-type rig. This swimbait is crafted exceptionally well, with a unique design crafted in 8 segments that move independently due to water and angler action, mimicking the swimming action of a baitfish. This makes it great for using it both as a swimmer and a suspended jerkbait, as it reacts quickly to motion, but in a natural way that won’t scare off crappie and other fish. It comes in four different colors, all rendered in bright and natural color patterns that are sure to attract fish, and is rigged with two high-quality treble hooks that give you multiple strike points where prey fish can latch on. And despite its 8 segment design, it’s quite durable, standing up to tons of strikes and many uses with no wear and tear. As for fishing action, if you plan on rigging it as a swimmer, you have two basic reeling methods. If you reel it in slowly, it will “swim” underwater towards you, attracting fish with its slow, natural action. If you reel it in quickly, it will rise up towards the surface of the water, and skim along towards you, with its naturalistic silhouette providing a perfect lure for crappie that are much deeper below the water’s surface. And though it’s heavy enough to sink under its own weight, it can also be rigged up as a suspender if you like, with just a bobber and a rig of your choice. 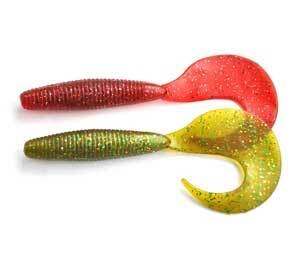 It's natural reactions make it a great jerkbait, and you’re sure to get plenty of hits. Crappie fishing is great fun, and hopefully, with the outlines of product recommendations and lure recommendations we’ve set out above, you’ll have a better time next time you go out to nail a few crappie. While this list is by no means exhaustive, it’s a great place to start. And remember, if you ever get tired of all the flashy lures and complicated riggings, you can always take a trip to your local bait shop. There’s nothing that crappie like more than a fresh minnow, insect, or worm if you feel like doing some good, old-fashioned live bait fishing.